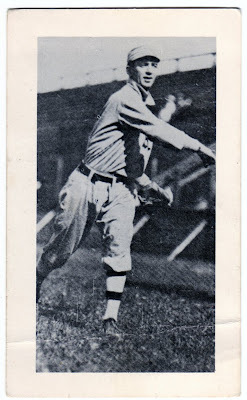 So this card of a 1916 player was issued in '63 by a bi-monthly mag or did I misunderstand somethin? This set's still kind of a mystery, but you got the main parts. 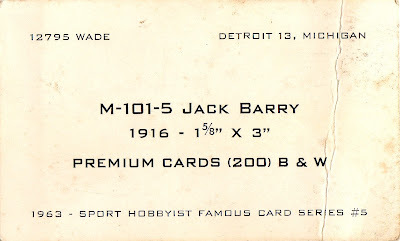 Sport Hobbyist did their own set of cards that reprinted the picture (but not the whole design) on the front with a description of the set on the back. The big SCD card catalog lists this as a multi-year set, from 1963-1967. I think the magazine either gave a half-dozen cards each year to subscribers or made them available for purchase. #5's dated 1963 and #7 is 1964, so the first cut-off is #5 or #6. Sport Hobbyist picked up with more sets (of different design) in the early-to-mid 70s.